Unit framework is 64” wide (load side) x 49” deep x 76” tall (±12”). Unit has a 4,000# capacity. Unit features an adjustable height structural support frame and bag strap hooks to accommodate bulk bag and drum size variances. Unit includes an integral, pivoting drum fill adaptor which is attached to equipment framework for easy implementation. Drum fill adaptor is actuated by two pneumatic cylinders and includes a compression seal for dust-tight filling. Heavy-duty tubular 304 stainless steel frame construction for strength and durability. 304-2b stainless steel fill head features a dust take-off port which allows venting of displaced air. Inflatable USDA/FDA approved spout seal creates a dust-tight connection to the bag fill spout and drum fill adaptor. Unit features a wash-down duty 304 stainless steel NTEP approved platform scale system. 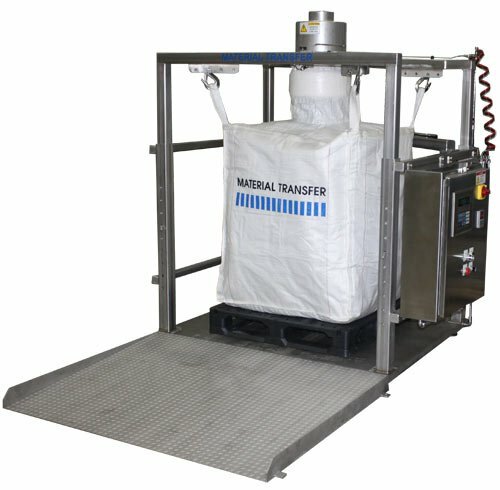 Unit features a 304 stainless steel ramp to allow bulk bags and drums to be removed via pallet jack. Unit features a NEMA 4X operator control station with a panel mounted digital weight indicator. Digital weight indicator controls a product indeed screw conveyor and roller slide gate (not shown).